Looking for recipes using Robert Rothschild Farm Pineapple & Habañero Sauce (or one that you made yourself)? This crispy pineapple-habanero chicken wings recipe is super easy and full of crispy deliciousness. A couple weeks ago we were browsing Costco and saw this pineapple and habanero sauce being featured that sounded different yet delicious. We didn’t actually try it while we were there but I figured it would be great on chicken and pork especially. I wasn’t quite sure how I wanted to use it yet. Then I remembered I had just pulled some chicken wings out of the freezer. 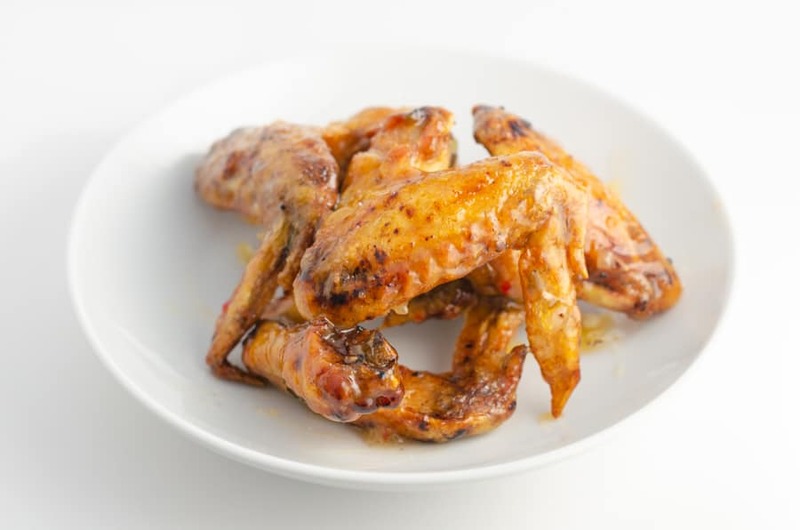 I love chicken wings and thought the pineapple and habanero sauce would be great to try on them over the BBQ or Buffalo sauce we usually use. I’ve been trying for a while to make really crispy chicken wings at home as they have gotten so expensive at restaurants. They’d stay crispy until the sauce hit them where, while they would still taste good, they would soften very quickly. I always just fried them once but finally had the idea to fry them twice like you would for really good french fries. Basically, you want to cook the wings at a low temperature so that the fat starts to render but the wings don’t get crispy and brown. I did this by frying at below 250F for about 15 minutes in my Lodge dutch oven that I always fry in. I then let the wings set at room temperature for about 45 – 60 minutes before frying at a higher temperature to get them really crispy. Make sure you use an oil that has a high smoke point like canola, vegetable, or peanut oil. You definitely don’t want to use something like olive oil. When fried this way, the wings stay really crispy, even when covered in sauce and even an hour later, which I’m all about. The sauce I made was really simple, too. I just melted some butter and added enough of the pineapple and habanero sauce to create a thinner but sticky consistency. If you do try the Robert Rothschild Farm Pineapple & Habañero Sauce, it has a nice little kick by itself When mixed with the butter and on the wings I found it to be very mild in spice but a nice flavor that wasn’t sweet or fruit-heavy. I do also recommend having a spider strainer as it makes getting the wings out of the hot oil and letting the excess oil drain over the pot so easy with the risk of burning yourself. You’ll also want a large bowl so you can toss the wings in the sauce and get them all nicely covered. I usually use a long set of tongs to make sure each individual wing is covered. I left my wings whole, but if you are less lazy than me and want to divide them and cut off the wing tips, a pair of kitchen shears makes it really easy. This crispy pineapple-habanero chicken wings recipe can be made super easily by using storebought pineapple-habanero sauce. Heat a few inches of oil in a large, deep pot to between 200 and 250°F in a large, deep pot. In the mean time, make sure all of the wings are free of any pin feathers and are dry. If the wings are wet, it can make the oil expand and over flow. Once the oil is heated, fry the wings in small batches for 15 - 20 minutes. You want the skin to start to render a bit, but you don't want the wings to start browning so make sure to keep the oil under 250°F. Place fried wings on brown baking paper or paper towels to drain. Let sit at room temperature for an hour. Alternatively, you can refrigerate the wings for up to 3 days until you're ready for the second fry. If you do this, I would let them warm up a bit before frying. When you're ready to fry the wings, heat the oil to 375 - 400°F. It's fine to use the same oil as earlier. When the oil is heated, fry the wings in small batches for about 10 minutes, or until they are at your desired crispiness. In the mean time melt butter in a small saucepan on the stove or in a microwave-safe dish in the microwave. Stir in the pineapple-habanero sauce and salt to taste, if desired. 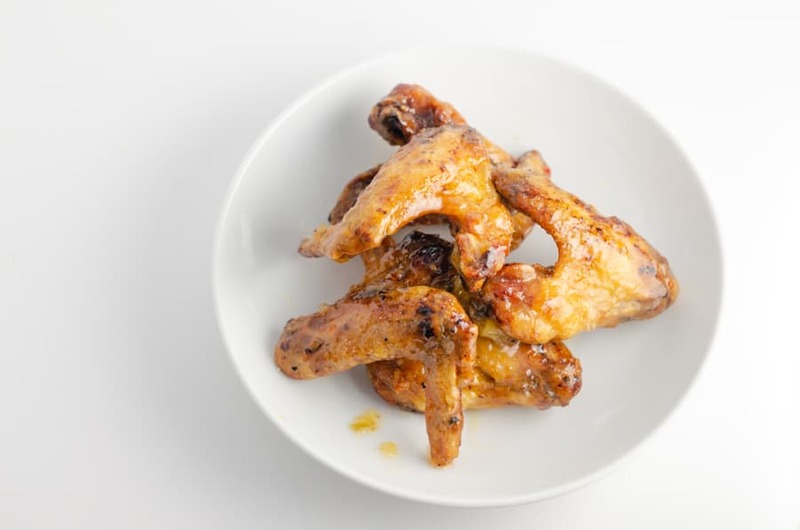 Once wings are at your desired crispiness, toss in the butter and pineapple-habanero sauce and serve immediately.